Today, Twitter has launched its own targeted advertising, which offers advertisers the option to target Twitter users’ specific ‘topical interests.’ The move puts Twitter a step closer to similar offerings from Facebook and Google. Twitter offers the majority of its advertiser one of two advertising options: Promoted Tweets and Promoted Accounts. Promoted Tweets highlight an advertiser’s tweets and displays them prominently on a Twitter user’s feed. Promoted Accounts are featured at the top of “Who to follow,” on the left of their homepage. Initially, targeted ads on Twitter were all-encompassing through geography and devices. 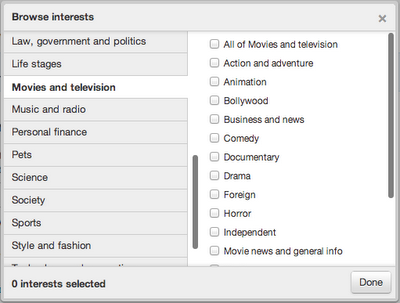 Targeting more specific categories wasn’t much of an option. But now Twitter offers two “flavors” of interest targeting. The first can refine an advertiser’s efforts with its Promoted Tweets and Promoted Accounts campaign by targeting more than 350 interest categories in a two-tier hierarchy. For example, advertisers can select individual genres of entertainment from the broader “Movies and Television” category, which you can see in the example below. To further sweeten the pot, Twitter has lowered the minimum bid for ad runs to just a single penny, which will likely lure in a large number of smaller advertisers that might not have otherwise opted to promote their product or service on the microblogging platform. To a degree, Twitter’s advertising services are nearing closer and closer to what Facebook has been offering all along. Even Twitter’s second flavor of interest targeting by usernames is reminiscent of Facebook’s sponsored results. Facebook advertisers can include their Facebook app or pages in the search results of its competitors by bidding for pages, apps, or places. With over 140 million monthly active Twitter users, and projected advertising revenue to reach $399.5 million by 2013, it’s still a far cry from the revised projection of $5.48 billion Facebook is expected to generate by next year. But the rate of its growth is indicative of the realization that Facebook’s ad revenue growth is leveling out, unlike Twitter’s hastening ad revenue growth. Facebook’s ad revenue is forecasted to grow 29.5 percent between 2012 and 2013, while Twitter’s ad revenue is expected to grow by 55 percent during the same period.